Last week we explored the earliest form of our language, that of the Anglo-Saxons. Now we are moving ahead to the next period in the development of our language, known as Middle English, and this period starts in 1066 with William the Conqueror. The Anglo-Saxons were not a unified people but were rather a bunch of tribes constantly fighting among themselves. Not until William, the Conqueror did what we know as England today have a ruling monarch. William’s conquest of the Anglo-Saxons culminated in the Battle of Hasting in 1066. Through his reign, William brought stability to England, albeit through subjugation of the Anglo-Saxons. Connecting this back to the history the English language, it is important to remember that William was from Normandy and would have spoken an older form of French. With William’s conquest, French became the language spoken by the ruling class. For the next two centuries, the monarchs and French would have been the language of the nobility. English, on the other hand, was the language spoken by the peasantry, the majority of the population. You can see this class distinction in English today. Consider the words chicken vs. poultry, cow vs. beef, or pig vs. pork. Notice how the word for the food from the animal is French, while the name of the animal is derived from Old English. While the monarchs for the next three centuries would identify as French, the Anglo-Normans gradually became culturally distinct and intermarried with the Anglo-Saxon population. In 1204, King John of England, brother to King Richard the Lionheart and the one depicted as the villain in the Robin hood tales, lost the English monarchy’s hold on Normandy. 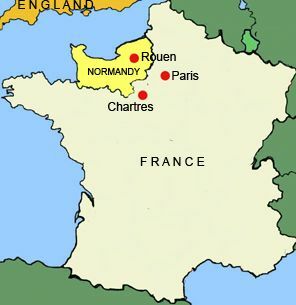 Eventually from 1337 to 1453, England participated in an intermittent war with France to regain their control of Normandy, known as the Hundred Years War. (We are actually going to read about part of the Hundred-Year War in Shakespeare’s Henry V.) By this point, the monarchs of England saw themselves as uniquely English. Though the spelling may be slightly different, most modern-speakers of English can recognize many of the words. (“shoures”=”showers,” “droghte”=”draught,” “perced”=”pierced,” “swich”=”such,” and “licour”=”liquour.”) Also, take note to how these lines of poetry contain words that derive from both Old English (“droghte,” “swich,” “Whan,” and “soote”) and Old French (“engendered,” “veyne,” “licour,” and “perced”). At this point, English took in many loan words from French. Three points I want to make about how Middle English was spoken. First, Middle English had many different dialects – the English of London was not pronounced the same as that in the Midlands. (Chaucer writers in a London dialect.) Also, the way vowels sounded is different than the way we say them today. For example, the “y” in “every” today has a long “e” sound, whereas in Middle English it had a long “a” sound. Another example is in the pronunciation of “shoures,” Middle English for “showers.” Today we say the vowel in this word with the same sound as in “bow.” In Middle English, this word would have a vowel sound similar to the long “o” in “boot.” Historian of the English language refer to this change in how vowels sound as the Great Vowel Shift. These opening lines to Geoffrey Chaucer’s General Prologue to The Canterbury Tales embody the English language’s evolution at this point.